Peta Bush is a designer, a researcher and visiting lecturer at The Cass, London Metropolitan University. She is based in London where she has undertaken Masters and PhD research into Therapeutic Jewellery as person-centric health devices. Her experience as an expert patient informs her work, and she co-designs with patients to inspire and inform the design process. Wearability is more than a body location and she has devised the '8 Layers of Wearability' as a model to evaluate and address issues of wearing health devices. By applying this model, key elements can be identified and developed to create desirable and long-wearing artefacts. She is interested in developing craft based methods to engage with participants' narratives. As an expert patient, she is aware of the many of the issues facing people with both chronic and acute health issues. She is now hoping to undertake further research into the use of digital technologies to design and fabricate orthoses (splints and supports) that are both wearable and desirable. Peta, how did you get into this industry? I am a patient with chronic health issues hEDS, POTS, IBS and now a breast cancer survivor of nearly six years, so I’m what’s called an ‘expert patient’. I have had to wear a range of medical devices, and many of them I have worn for years. My experience was that they were mostly unwearable, and this was not being addressed by designers. No-one was considering how to develop the design of these particular intimate objects. So having been medically retired from work, I learnt jewellery design, and then at London Metropolitan University, I began a research Masters into Medical Jewellery – where I designed 3D printed jewellery that worked on acupressure points. From here I applied for the vice chancellor’s scholarship at my university and was awarded a grant to study jewellery with health functions for a PhD. I have recently completed the PhD, where I developed Therapeutic Jewellery as Wrist Orthoses (splints or supports). I used digital technologies and also collaborated with crafts people to design a 17 piece collection of wrist orthoses, these were fabricated using 3D printing and craft methods using silver, wood and felt. I am now putting together a proposal to research into digital technologies for soft orthoses. Also I provide consultancy and workshops for those interested in exploring what ‘wearable’ means other than a location on the body and who would also like to experience or develop co-design methods. It is only since completing my PhD and also getting articles published that I have felt that I have a voice and that industry is interested in hearing what I have to say. The mindset of some of the wearable medical device design companies means the wearer is often not at the centre of their design process. I try to promote a design-for-care ethos that includes a person-centric approach, and which considers the psychosocial issues of wearing objects and the transformative nature of worn objects for their wearers. I began my MA in 2008 and defended my PhD thesis earlier on this year, so it nine years so far of hard part-time study. However my lifetime experience as a patient and wearer of medical devices is really what has brought me to this point. 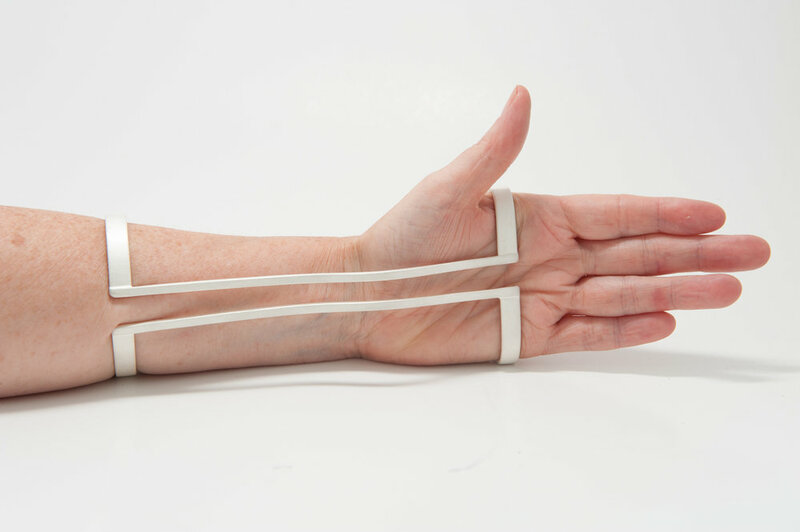 There were two: The first was resistance to change - I realised that the healthcare professionals who prescribed these devices were not in a position to develop the designs to be more wearable and desirable; and the companies that make off-the-shelf splints did not appear interested in changing their own mindset towards their clients and their products. So that’s when I began to consider how to resolve some of the issues myself. Secondly, I have long-term health issues, which fluctuate on a day-to-day and even on a hour-to-hour basis. Managing these health issues, is like a full-time job, so taking on rigorous study, as a mature student, was only possible if I could study part-time. Also the workplace is not really accessible for me - I need to have flexible working hours and somewhere to rest and business simply does not consider how to make the workplace accessible other than a ramp at the front door! So academic research was the easiest route for me, particularly since I had understanding supervisors; and I was able to do a lot of the research at home and work around my illnesses. Completing the PhD has to be right up there, it took a lot out of me physically and mentally and ruined a social life that was already pretty poor due to my health! But I am still amazed to have arrived here at this point. I am finally engaging with others in the field and disrupting thinking wherever possible, whether it’s with students, academics or industry and healthcare professionals. What does the #WomenInTech movement mean to you? What are the challenges of being a woman in wearable tech / STEM? I think that a woman-orientated organisation is always important in what is still a male (able-bodied and white) world. I also feel that an equal emphasis is needed for all people whether its disability, gender, race and age. I am enthused to see so many women involved in tech and in wearables in particular, and the need for a woman-focused organisation is so important. In wearable tech/STEM, we are on the frontline of dealing with the stereotypes of being a woman and also finding ways to empower ourselves to deal with this, alongside developing our concepts into successful solutions. In your opinion, what will be the key trends in the wearable tech and digital health tech in the next 5 years and where do you see it heading? At present ‘wearable’ only means body-location and I think that as people become more aware of the transformative power of the worn object on the wearer, then more interesting and meaningful solutions will be designed and fabricated. For me, advances in materials and fabrication techniques will support a more personalised approach rather than some of the more prosaic and often dull solutions that I see at present. As more jewellery and fashion designers become involved in the field, we are beginning to see designs that people can feel emotionally engaged towards and that are meaningful for the wearer. Who are your 3 inspirational women in wearable tech and health tech? Mary Ann Scherr: This American jewellery designer was way ahead of her times, and yet very few people have heard of her! She was already designing wearables in the form of bio-sensing jewellery in the 1960s and 70s. She found an engineer who managed to miniaturise the required elements, around which she then designed her jewellery. She was the only person to be exploring wearables in this way and was alone at the time in designing and fabricating jewellery with health functions. Suzanne Lee: For her fascinating research into bio-fabricated materials. She is creative director of Modern Meadow, a biotechnology company exploring materials created from nature’s building blocks. They have recently showcased a lab-grown leather used to create clothing; and these bio-fabricated materials could really help deliver more environmentally responsible solutions and also more innovative wearables. Madeleine Schwartzman: For highlighting the relationship between the body, the senses, design and technology and considering the boundaries in which we can work. Her book ‘See yourself sensing’ points to a future that is thought-provoking and showcases work at those porous and expanding edges of wearability, design and the senses.